Most Ukuleles seem to be either flat top or pressed arch tops. 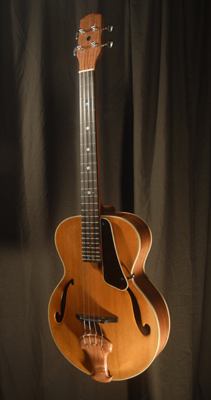 Given my affinity for archtop instruments I decided to offer a hand carved arch top model, which are largely unavailable. Being a baritone it is tuned DGBE like the high 4 strings of a guitar allowing easy adaptation for many players. This example has Black Walnut back sides and neck. The top is red cedar, bound in a traditional multi layer plastic binding. 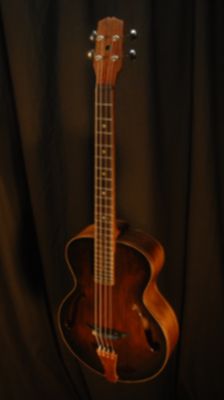 The top is red cedar with a hand rubbed tobacco sunburst, and bound with maple/walnut/maple wood bindings/purfling.